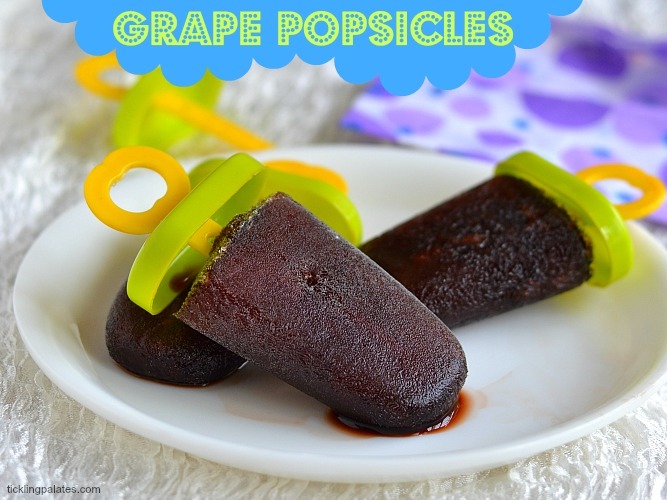 These Grape Popsicles are easy to make and fun to eat. A popsicle is a great way to beat the heat on a hot summer day and both kids and adults enjoy them equally. These are the same old, colored golas that we used to get in the 80’s and 90’s at the road side shops. I used to love the “Bovonto” drink of yesteryear and as kids, myself and my brother used to fill the ice cube trays with the beverage and relish them once they are frozen. Back then a fridge in every home was a rarity in itself and when we ourselves got one for our home, I was on cloud nine imagining all the frozen treats that I could enjoy eating. 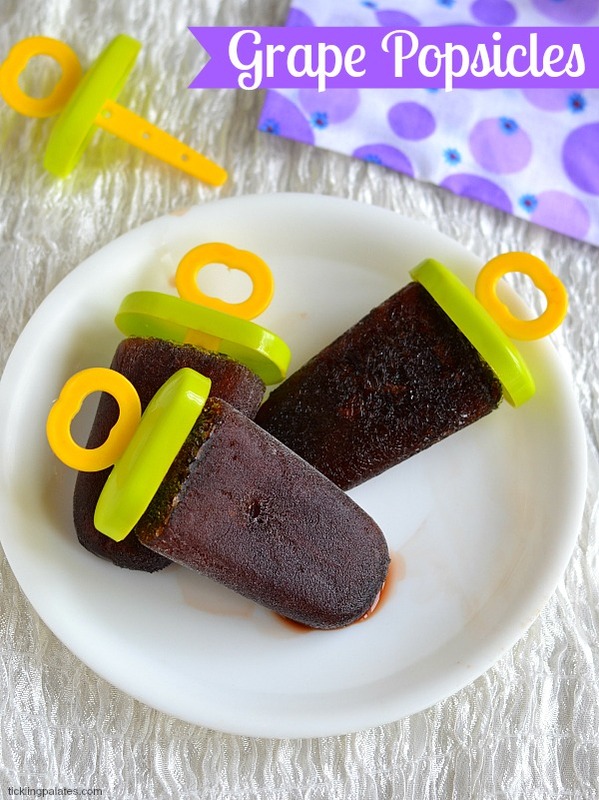 These grape popsicles are inspired by that very drink and the grape juice that I make almost everyday. 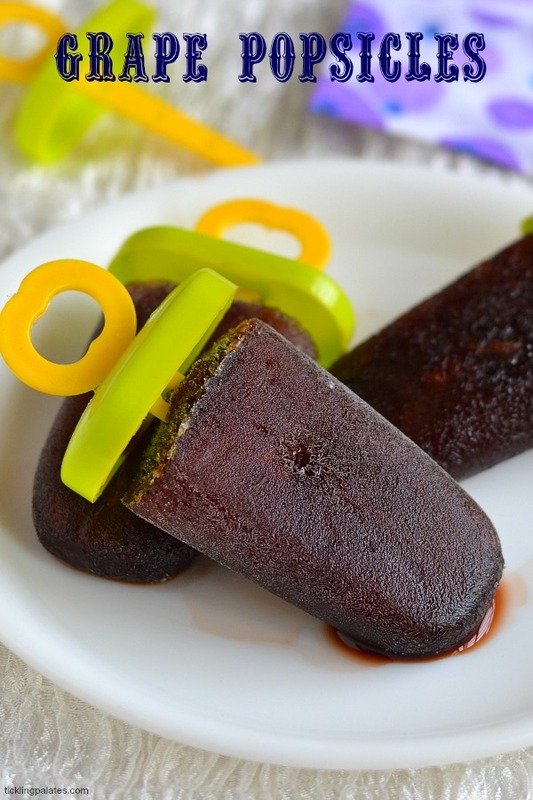 Kids loved every bite of this one and it takes just 5 mins of cooking time to make this grape popsicle happen. Make some, enjoy and stop complaining about the heat. There’s no use in sighing when you cannot do anything about the heat and the blasted hot sun but still you can chill yourself by enjoying this frozen treat. I used my extractor attachment that came with the mixie but if you do not happen to have one, then you can put the grapes in a blender and just pulse at short bursts and pour it into a colander to extract the juice. Do not grind it continuously as the seeds of the grapes will alter the taste. Make and enjoy these summer recipes – watermelon slushies, watermelon agua fresca, strawberry mojito, green goddess mocktail and badam pisin khus sharbat. 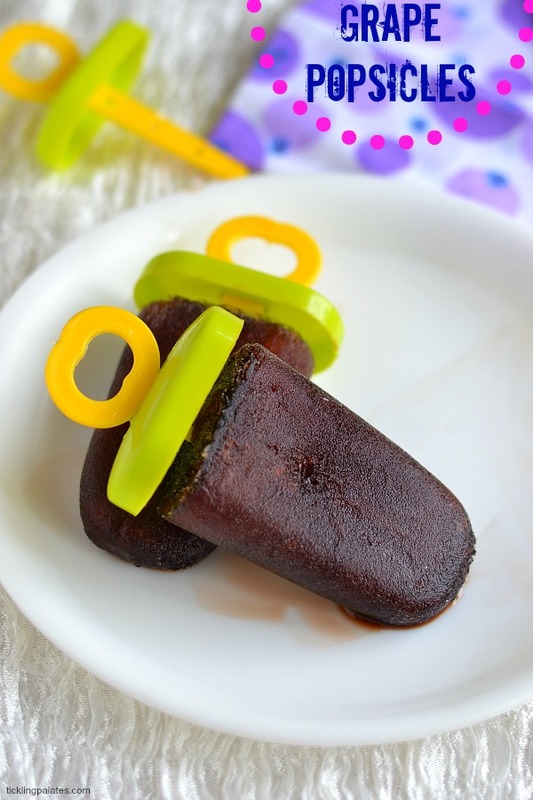 Grape Popsicles recipe makes a great frozen treat to enjoy on a hot summer day. Wash the grapes. Place them in a wide pan and using a masher gently crush them till the juice comes out of them. Place the pan on the stove and cook over medium flame for 5 minutes till the mixture starts to bubble. Keep mashing the grapes gently while it is coming to a boil. Take the pan off the stove and let it cool down. Transfer to a juice extractor and extract the juice from the grapes. I used my extractor attachment that came with my mixie. Add sugar, salt to the extracted grape juice and stir until dissolved. Finally stir in club soda and Tonovin essence. Fill the popsicle mould, insert the popsicle stick, cover and freeze them for 5-6 hours or overnight. Before serving, place the mould in water for a minute, unmould the grape popsicles from its mould and serve immediately. These grape popsicles need to be refrigerated for 5-6 hours before serving. Beautiful clicks. Nice addition of club soda in the Popsicle.